Spam emails have become commonplace, and they're crafted in a variety of ways. 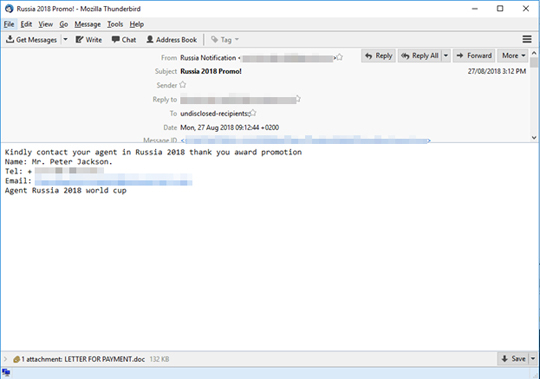 In a recent spam campaign that we detected, the 2018 FIFA World Cup held in Russia was the subject of interest, where scammers take advantage of fans' interest and excitement for the international football tournament. The emails came from different senders and in different methods to rob recipients of their personal information. The images in the email are either blurry or stretched out. Moreover, the text itself is lengthy and descriptive, as if enticing the readers to read the whole thing and trust its supposed credibility. 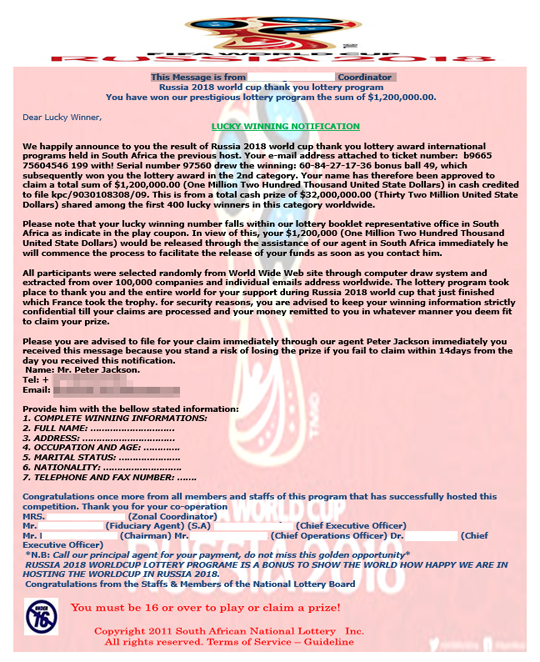 These scammers use an image containing a fake lottery win notification that is attached to a document file. It indicates information on how the recipient can claim his/her reward. One of the schemes employed is to give personal information in order to claim the prize. Spammed messages such as this one should remind users to be more aware of the different email schemes scammers may use to take advantage of current news and events. Users are advised to carefully check unsolicited emails before clicking on any links or attachments. Always exercise caution and do not give out personal information, especially if the requests come from unknown email senders.